Mr. Benjamin Howes (center) takes the hand of Ms Kim Mi-Hye to pose for camera with his guests at Ritz Carlton's Presidential Suite in Seoul's Yeoksam-dong on Jan. 9, 2010. Luxury hotel in Seoul’s Yeoksam-dong, The Ritz Carlton's “Presidential Suite” has recently been open to a group of both foreign and local nationalities with the help of a local brewery. On the occasion of the birthday of a Canadian citizen, Mr. Benjamin Howes, Marketing Manager at Jaseng Hospital of Oriental Medicine, Ritz Carlton’s most expensive room was offered to a group of expats and locals including media representatives. Of course it was not free of charge but at a much reduced price. The Bae Sang Myun Brewery Company provided scores of guests with hundreds of its best traditional wine “Sansachun” for no money. Ms. Kim Mi-Hye (center) poses with her friends at Litz Carlton Seoul's Presidential Suite in Seoul's Yeoksam-dong on Jan. 9, 2010 on the occasion of the birthday of her husband, Mr. Benjamin Howes. 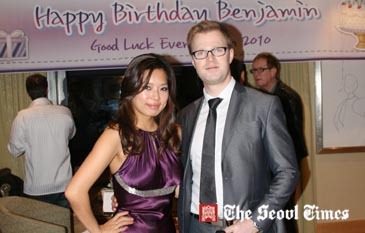 The gala birthday party was held on Jan. 9, 2010 on the 17th floor of the hotel which commanded a majestic view of Seoul’s posh and wealthy Gangnam area. The guests were mostly foreign business professionals and opinion leaders from a variety of countries. They all enjoyed the comforts of the hotel’s trademark suite. The suite’s two balconies offered panoramic views of the Gangnam skyline. Throughout the evening guests were able to experience and enjoy one of Korea’s more popular traditional Korean wines, called Sansachun. All of the guests greatly enjoyed the sweet taste of the wine, which comes from the Sansa fruit berries, unique to Korea. The traditional Korean wine was provided to the guests by the Bae Sang Myun Brewery Company. Located in the rich southern half of Seoul’s Gangnam area, the Ritz Carlton caters to the need of both local and international guests from 3,000 global business brands including such local conglomerates as Samsung, LG, POSCO, and Hyundai-Kia. The hotel also provides optimum location for international shoppers in the wealthy Gangnam area of Seoul. Among its 375 newly renovated guest rooms, 83 are suites and 100 are club level rooms. Its Presidential Suite is the best and the only room normally saved for top VIPs. The Ritz Carlton also features four restaurants, a lounge and bar, a deli, and a variety of banquet rooms. The Ritz-Carlton’s Fitness Club & Club Lounge are usually fully booked. The hotel’s surrounding tourist destinations and luxury shopping outlets are a special advantage. Cheongdam-dong designer boutiques and Seoul’s four most luxurious department stores as well as the COEX convention center complex (Korean World Trade Center and a Casino) are all close. For details call the “Ritz Carlton, Seoul” at 3451-8000.